Loxit’s N-Series adjustable projector clamps entrap almost all models of modern overhead projector. The N-Cage is particularly suited to a custom built close tolerance fit although the standard models are suitable for the vast majority of projectors. Must be used in conjuction with Loxit’s compatible heavy duty security cable set which are available in a variety of lengths. See product range 8030. 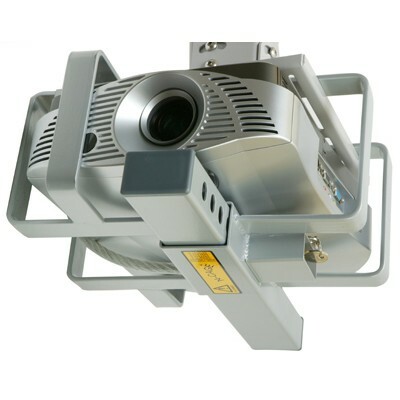 Developed to be fully compatible with Loxit’s projector ceiling mount kits, the adjustable chassis allows the clamp to closely grip the projector whilst the locking mechanism is shielded by the projector chassis itself. A heavy cable and shielded lock attaches the clamp to the building’s fabric for a higher projector security solution. Maximum projector size 300mm wide x 130mm high. The N-Cage Small projector clamp is effective in achieving a close tolerance fit to small projectors. The projector clamp must be secured with a compatible heavy duty cable set product range 8030-8062. 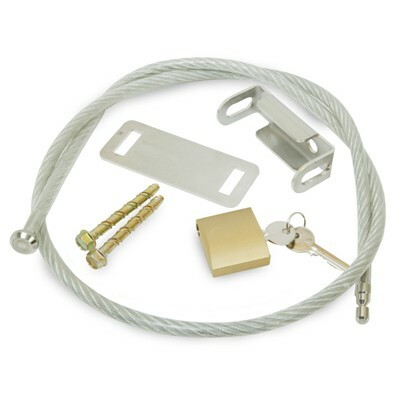 For a total security solution the clamp and heavy duty cable set may be coupled with a motion sensitive alarm.